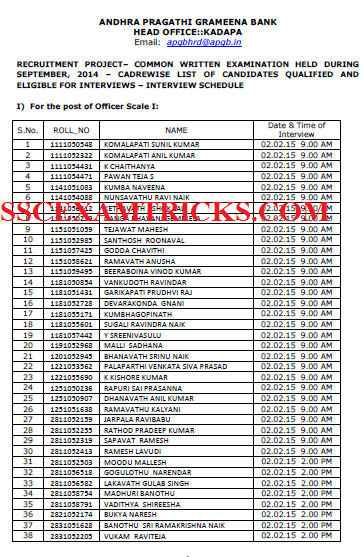 Andhra Pragathi Grameena Bank (APGB) has released the result/Merit List of Officer Scale I and II based on the performance in IBPS RRB CWE III held in the month of September/October 2014. APGB has released the list of short listed candidates called for interview which is going to be conducted from 02nd February to 12th February 2015. Interview Call letter has been sent by post/courier to the correspondent address of the candidate which was mentioned in the application form. All the selected candidates must reach the venue of Interview at least 20-30 minutes before the time mentioned (9:00 AM Sharp) on the interview letter of the candidate. Selected candidates are required to bring computer generated online application, result print, original documents (10th, 12th, UC DMC, Cast certificate –If applicable etc.) and one set of self-attested of all the documents to the venue of interview. 10th Certificate is used for Age Proof. Candidate must bring at least one Address proof i.e. PAN Card, Ration Card, Aadhar Card, Voter card or Driving License. Candidates are advised to bring two extra colored recent passClerkrt size photograph (same as pasted on computer generated application form) required for application form or other document requirements. Candidate must bring Caste/PWD/EXS certificate to claim for seat available for reserve category. If the candidate is an employer of any organization then it is mandatory to bring original as well as photocopy of NOC (No Objection Certificate) with them.